The Australian fertilizer producer Incitec Pivot imports phosphate from occupied Western Sahara in violation of international law. Australian Council of Trade Unions, and Australia Western Sahara Association protested at the company's annual general meeting. 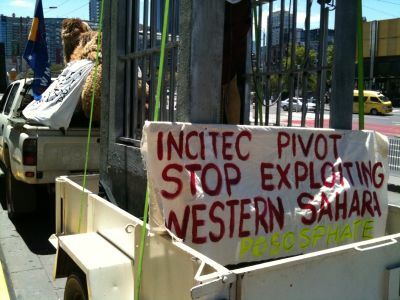 Members of the Australia Western Sahara Association (AWSA) organised a demonstration during the Annual General Meeting of Incitec Pivot, one the Australian companies that imports phosphates from Western Sahara illegally. The meeting took place in Melbourne on 23 December 2009. Members of the Association asked questions to the management of the company during the meeting and drew attention to the illegality of the import of phosphate from an illegally occupied country – Western Sahara. 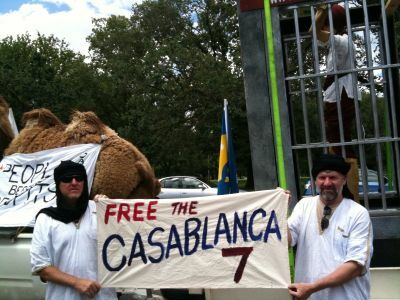 They also raised the issue of the abuse of human rights in Western Sahara and mentioned as an example the case of seven Saharawi human rights activists who were arrested in Casablanca and called for their immediate release. "The news that seven human rights activists are in prison simply for visiting refugee camps, and could face the death penalty, is appalling. They should be released immediately. The Australian union movement stands in solidarity with our international colleagues in support of an urgent and peaceful solution to the occupation of the Western Sahara, and the right of the Western Saharawi people to vote for self-determination. Some Australian companies are indirectly supporting this occupation through their importation of phosphate from Western Sahara . They include the listed Australian chemical and fertilizer manufacturer, Incitec Pivot. Incitec Pivot should appreciate that by trading in Western Saharan natural resources it is contributing to the worsening plight of the Western Saharawi people, because it encourages Morocco to continue to plunder the natural resources of these people." AWSA issued the media release below. The Australia Western Sahara Association will be attending Incitec Pivot AGM today 1.30pm outside the Melbourne Exhibition Street, 2 Clarendon St , Southbank. AWSA will protest the illegal plunder of Western Sahara resources and will ask questions to IPL management. Why is SuPerfect a problem product? The product Incitec Pivot calls SuPerfect is less than perfect. A significant component of this fertiliser is phosphate rock sold by the Moroccan state company OCP. But this natural resource does not belong to Morocco . It is not theirs to sell because it comes from BouCraa mine in Western Sahara, a country occupied by Morocco . No country in the world recognises Morocco ’s claim to Western Sahara . Incitec Pivot is virtually receiving stolen goods. Western Sahara, lying south of Morocco on the Atlantic coast, is designated by the United Nations “a non-self-governing territory”. This means it needs to be decolonized through a vote of self-determination. When Spain , the colonizing power, was on the point of organising such a referendum in 1975, Morocco invaded and persuaded Spain to hand the country over. A war with the indigenous people called Saharawis broke out and continued until the UN and African Union sponsored a cease-fire in 1991. A UN mission was then set up to organise the referendum in which the people exercise the right to independence. This vote has not been held. In 2002 the United Nations issued a legal opinion that the natural resources of Western Sahara belong to the indigenous people and should be held in trust for them until they can determine their own affairs. However, it also says that exploitation can only take place if the people wish this to happen and if it is done for their benefit. One problem here is that half the Saharawi population lives in refugee camps over the border in south-west Algeria . They certainly get no benefit, on the contrary, every time Morocco ’s position is given legitimacy their suffering is prolonged. Human rights defenders living in the occupied zone are persecuted with impunity. Seven of them face a military trial right now simply for having paid a visit to the refugee camps. * Does IPL have any documentation that the Saharawi people wish them to trade in their phosphate rock? * If so, can IPL demonstrate where the benefit from the trade goes?